With the help of a Value Ladder, you can build a whole suite of products to sell, each of them increasing in value. Imagine a system that lets you create several high-value products. You can use this system for upselling and cross-selling. You can also use this system to recommend higher-value products to your existing customers. This helps marketers increase the overall value of the customer. Businesses can offset the cost of customer acquisition. It fuels returns from email marketing campaigns as well. A Value Ladder also gives a solution for single-product businesses to grow their email list quickly. All they have to do is release a free, moderate-value product (called the "lead magnet") and share that with their visitors in exchange for their email address. This way, a Value Ladder is one of the most important foundational concepts of running a successful online business. What is a Value Ladder? Technically, a Value Ladder is a mapping of all your products / services, each one priced higher than the previous one. At the level 0 of this ladder, you give out an important (but free) artifact of moderate value in exchange for the visitor's email address. He gives his email address to get the free value product and enters your email list. This free artifact can be anything that gives just enough value and leaves the visitor wanting more. The real advantage of Value Ladder? It ensures you don't lose sales by addressing clients with all kinds of budget. For example, consider having just one product / service. This is an example of a flat business model without a value ladder. If a customer has less budget than the value of your single product / service, you will lose the sale. If the customer has more money to spend, the price of your product / service is too low for his budget. Thus, you leave money on the table. With a Value Ladder, you ensure that clients of all budgets are served with an appropriate amount of value. It also gives you something to up-sell to clients already on a particular step of the ladder. As clients climb up the value ladder, they pay more and your revenue increases. 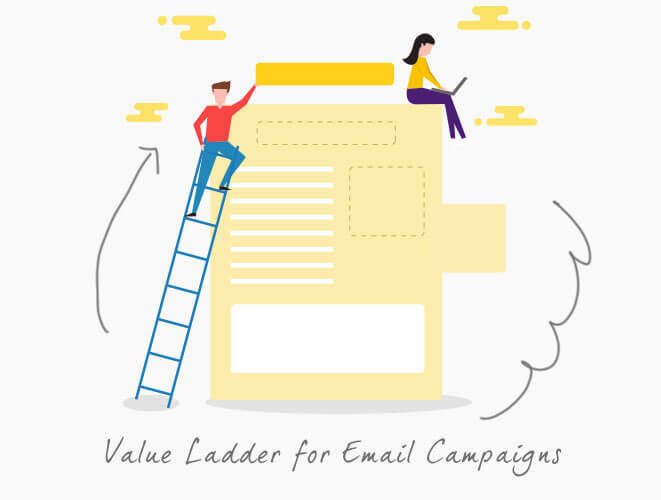 Your Value Ladder is the backbone of all your email marketing campaigns. At the bottom of this ladder are visitors who are not on your email list. They have just expressed interest in your brand by visiting your site and sharing your content. However, to make them climb the value ladder, you need to first turn them into leads (i.e. get them on the first step of the ladder). At step 0 (bottom of the value ladder), you create something called as a “Lead Magnet”. A Lead Magnet is an artifact that solves a very common problem among your potential customers. It also has to be free because when they’re not on the list, they don't know or trust your brand. Once they're on your email list, you start them off with a welcome campaign drip series. After the w campaign, lead nurturing emails of different categories are sent help to inform, educate, and attract the customers. At each step, you have to send a different set of emails that are designed to up-sell products at the next step of the ladder. As they read your emails and click through them, they will keep climbing the ladder. This ladder is immensely helpful in various ways. First, customers who are not ready to buy still have to be on the email list to receive updates on discounts. You just have to impress them with your content and make them aware of these offers. Once they're on the list, keep sharing great content and advertise higher-value products once a while. Secondly, customers who have already bought something from you can receive regular product updates from your email list. You can market your products that are in the same price range that these customers have already spent money on. Finally, customers towards the top end of the value ladder are already invested heavily in your brand. They know your business inside out and they trust your brand. You can use these customers as beta testers to collect feedback for new features (and pricing) of your product / service. Once they share their feedback, you can work on it, make changes to your product / service, and open up the features to the rest of the customers. Also, this third class of customers can also be great candidates for evangelism and may even be turned into affiliates. Every organization must sell more than one product, all of them increasing in value. This list of products with increasing prices is called the company's Value Ladder. The lowest priced product or service will be at the bottom of the Ladder; the highest priced one will be at the top. The steps will comprise of mid value products arranged in increasing order of their price. If your organization sells only one product, it's high time that you created a complete value ladder. 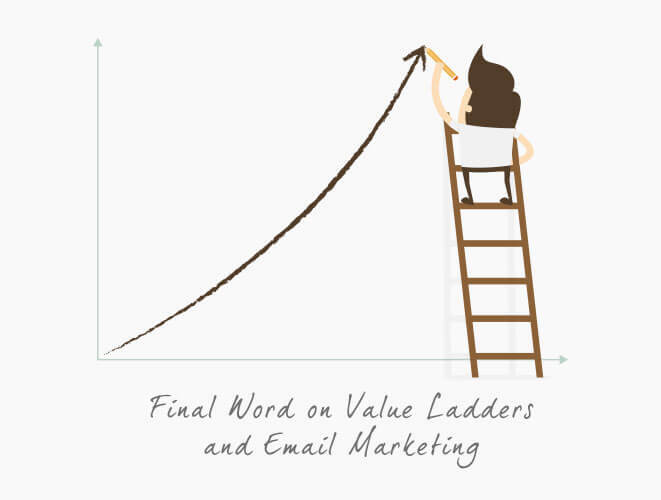 Both Value Ladders and Email Marketing are complementary to one another. The first step of this ladder is usually a free product. Once the visitor becomes a lead, he steps on the first step of the ladder. Moving from first step to the second step will need the lead to become a paying customer. We can use email sequences to make the customer curious about the next level of products. Customers at different levels of the Value Ladder can be served with different types of email campaigns.